Designs by Romi (dbR) is the knitwear design house of Rosemary (Romi) Hill, a lifelong knitter, crafter, maker, and seeker of beauty. 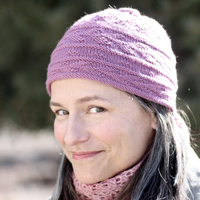 After falling in love with lace knitting, Romi founded dbR in 2005 as an internet shawl pin shop. She then moved into knit and crocheted jewelry, having her first of many patterns published in Knitty Magazine. Her first book for Interweave Press (Elements of Style: Knit and Crochet Jewelry with Wire, Fiber, Felt & Beads) soon followed. She went on to design lace shawls and garments, having patterns appear in Interweave Knits, Knitscene, Vogue Knitting, Twist Collective, Making, and numerous other books and magazines. Her second Interweave Press book, New Lace Knitting, was published in 2015 and features timeless patterns for garments and accessories. Along the way, Romi's library of self published patterns has grown to over 140. Her designs are known for their organic flow and knitterly attention to detail. Born and raised in the San Francisco Bay Area, Romi (pronounced roe-me) lives on the eastern slope of the Sierra Nevada mountains in Northern Nevada, where the high desert nights are cool and the air is clear and crisp. She loves spicy food, cool breezes, and cowboy boots.